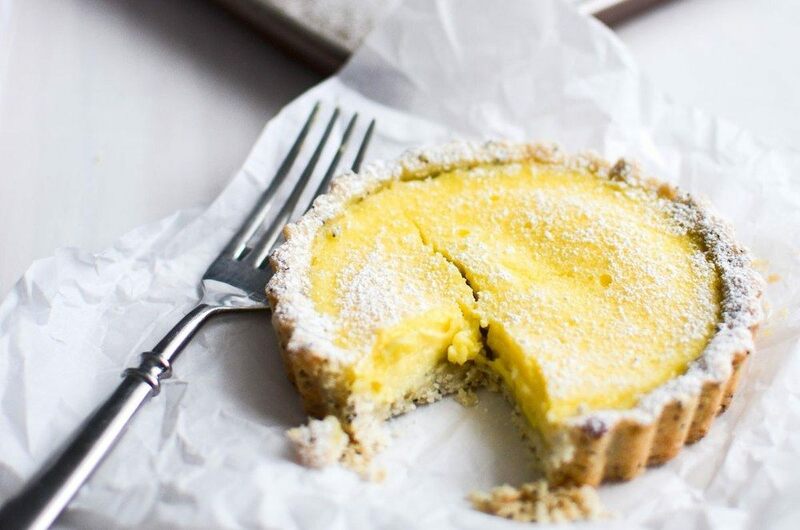 My Lemon Tart with Poppy Seed Shortbread Crust is perfect for sweetening up the last weeks of winter. It's the ultimate lemon dessert! For the poppy seed crust, combine the flour, melted butter, sugar, cornstarch, salt, and poppy seeds in a bowl and mix until all dry flour is incorporated and a dough forms. It will be slightly crumbly, but will hold together when pressed between your fingers. Pat the dough into four mini tart pans with removable bottoms, and put the tart shells in the fridge for about 30 minutes. To make the filling, add all the ingredients to a bowl and whisk together. Bake for about 20-25 minutes or until the filling is just barely set. You should have a very slight wobble in the middle of the tarts, but nothing that still feels liquid-y. The shortbread tart shells should be lightly golden. Let the tarts cool at room temperature completely in the tart pans, then remove the tarts from the tart pans, and top with powdered sugar when ready to eat.